As if a report that Snapchat CEO Evan Spiegel had been spotted wearing a pair of camera-packing sunglasses wasn’t enough, now Business Insider says it has an ad or demo video showing the product. Apparently posted to YouTube until it was taken down by a Snapchat claim, it shows “Spectacles by Snapchat” or “Snapchat Spectacles” briefly, then video from the perspective of the wearer. There’s no indication of any augmented reality capabilities, but if you were creeped out by Google Glass you may get a similar feeling here. What we can see however, is that the round camera and logo shape may be an indicator of circular or spherical video, that displays correctly whether you’re watching on a display that is in landscape or portrait. Two years ago, emails leaked from the Sony hacking revealed Snapchat’s purchase of a company, Vergence Labs, that was developing a product building video recording into glasses. Called Epiphany Eyewear, the prototypes looked similar to what has been spotted on Spiegel and in this video. 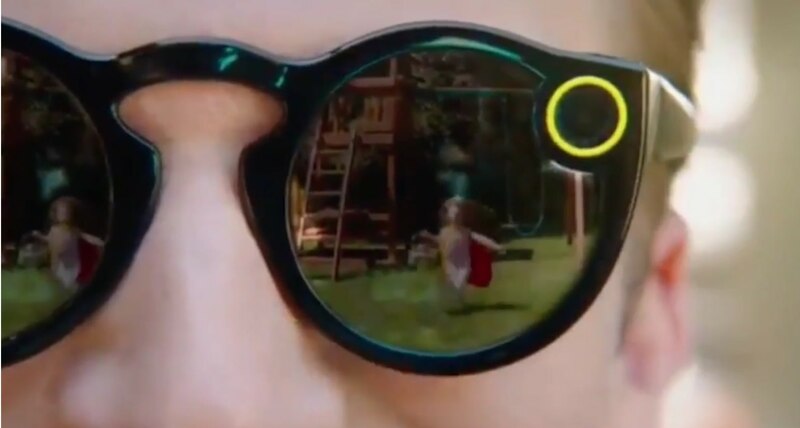 There’s still no way to know how close these “Spectacles” are to production, but hopefully Snapchat will have its filter problems cleared up by then.